When imagining the French countryside, I dream of saturated color, sunshine, gardens and homegrown food cooked in rustic country kitchens. Ideally kitchens should be tucked into homes with stone walls, and with windows framed by wooden shutters that flaunt the charmingly peeling paint. 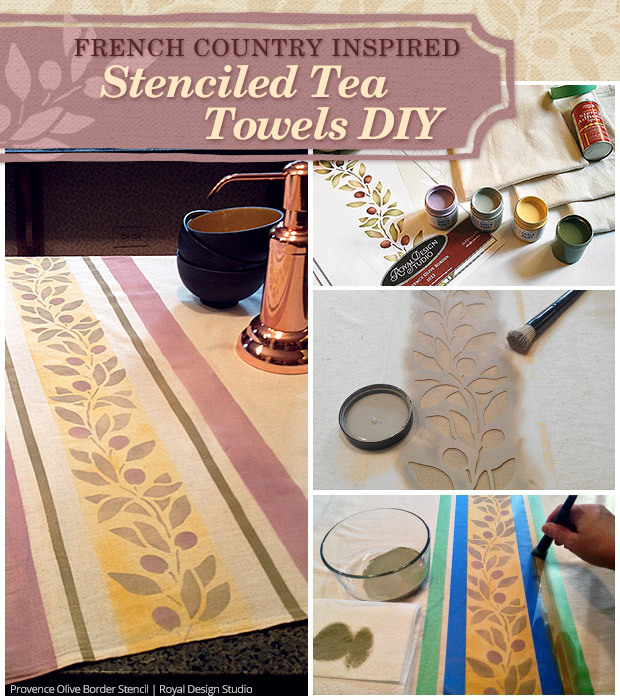 Something just like in this photo that popped up on Pinterest and gave me the inspiration for today’s DIY idea: kitchen towels made from old-fashioned flour sack material and stenciled in a French country color palette. Pro tip: If you’re ever uncertain about choosing colors, or if you want to try out a new color palette that you haven’t used before, look for images you like and pull the colors from it. 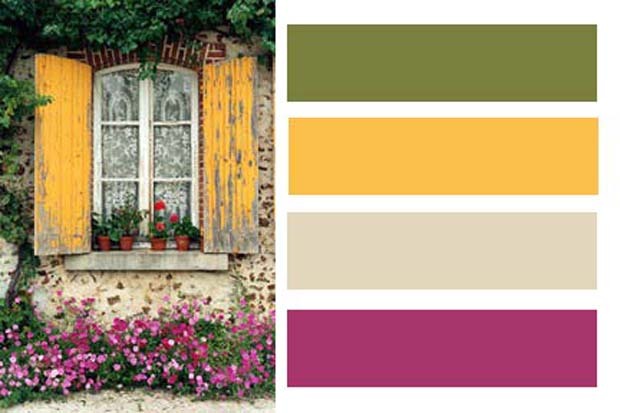 I admit I didn’t know much about French country colors, other than I imagined they’re “colorful.” Well how specific is that?! But from the photo above, I was able to choose Chalk Paint™ by Annie Sloan in similar colors. I never would have thought of these colors together without the inspiration photo! Something else that makes me think of the French countryside is vintage grain sack linens. And did you know, you can use flour or grain sack material for kitchen towels? 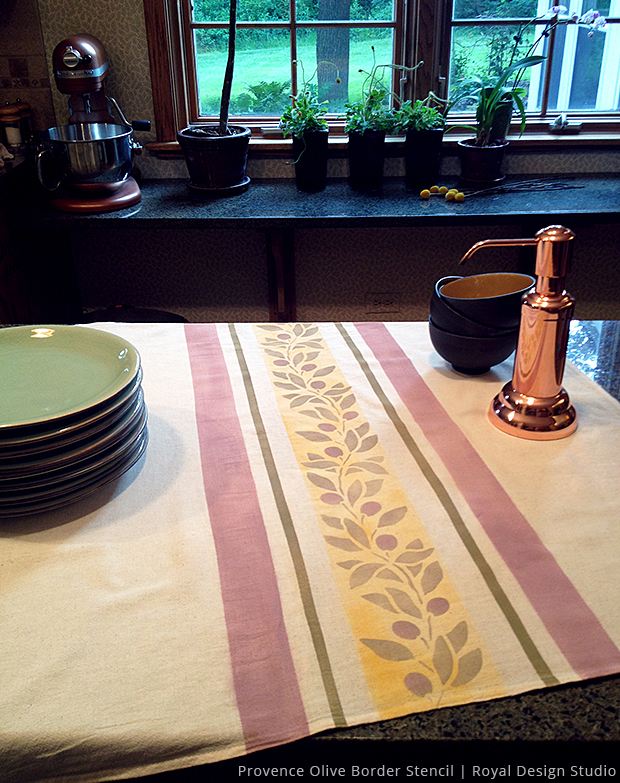 I stumbled upon a great source for flour sack towels that are made in America, by textile designers in Chicago. They have revived on old Colonial American and European tradition of using flour sacks as towels and sheets. 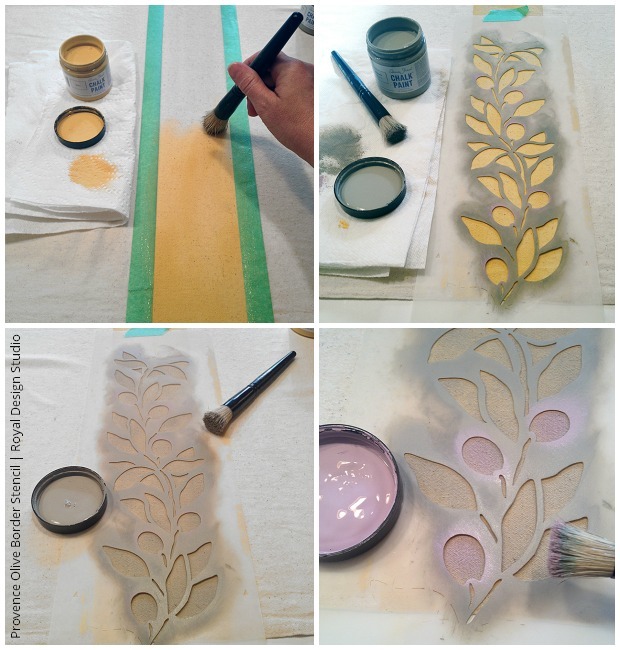 You can get plain white towels or organic unbleached cotton towels to paint or embroider with your own designs. This type of towel gets softer as you wash it, it’s durable, it soaks up water and dries things off far better than terrycloth towels, in my experience. Our glasses are always dried off without any lint. Beyond the functionality, this material has style – it’s the perfect look for a French country kitchen towel. But before painting on the towels, I first experimented on foam core board that was on hand for photo shoots. You can experiment on paper or whatever you have available. With four colors of paint, you can get a large variety of looks by using the paints in different ways. One of my practice color combos was cheerful, the other moody. From practicing, I learned I wanted the cheery look, but needed to de-emphasize the dark Olive color in the stripes and play up the purple Henrietta color. I’d recommend taking this extra step so you can learn what you like and don’t like. You may be happier with your final result. To create this look, use a ruler to find the middle of the towel. The middle on my towel was 13 inches. 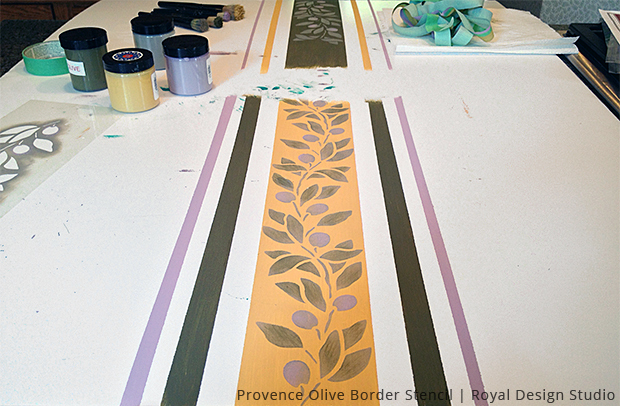 Then with painter’s tape, tape a wide stripe down the middle, planning out the width so there’s room to paint the Provence Olive Border Stencil on top of the wide stripe. Spray the stripe area lightly with water. This will help the Chalk PaintTM to go into the fabric instead of just sit on top of it. It also lightens the paint and makes it look soft and vintage-y. After you spray with water, be sure your painters tape is still adhered well to your towel. 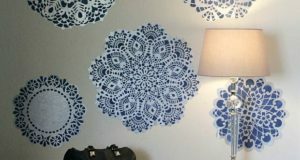 As I painted, I kept pushing the tape down with my fingers so that the paint wouldn’t go under the tape. Fill in your stripe with paint. 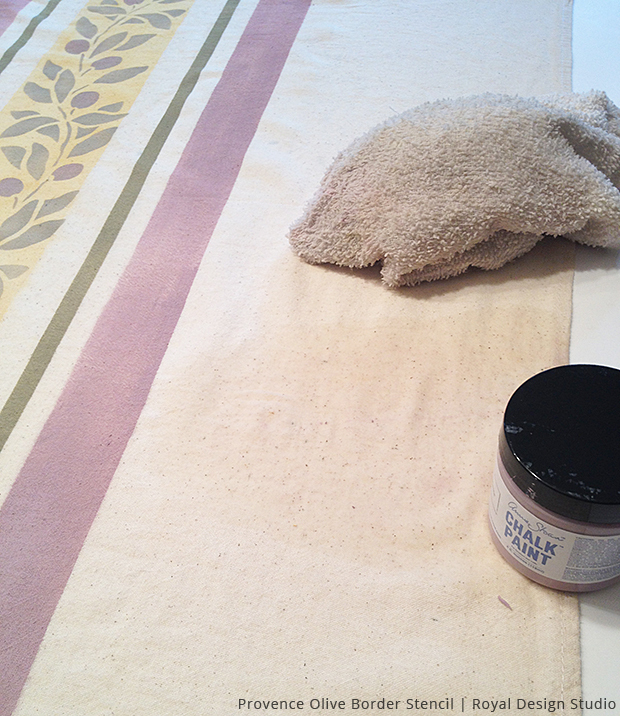 Don’t load up your brush too much — just dab it lightly into the paint and then brush it on the damp fabric. You’ll see the water will make the paint look a bit transparent. You can paint several light layers if you want to build up a darker, bolder look. 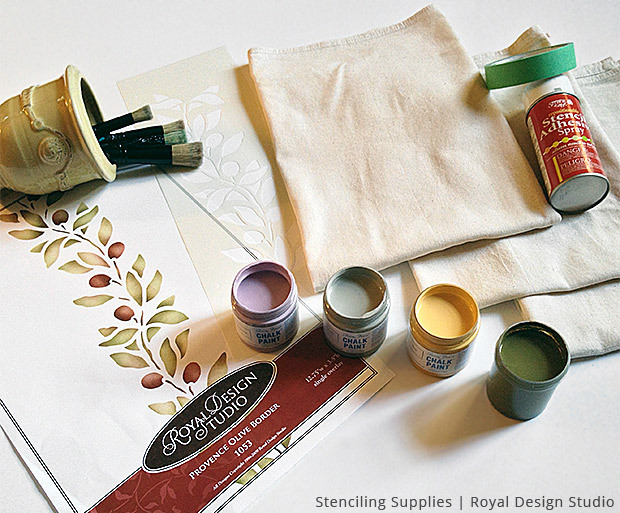 Chalk Paint™ dries fast so you’ll probably immediately be ready to stencil. 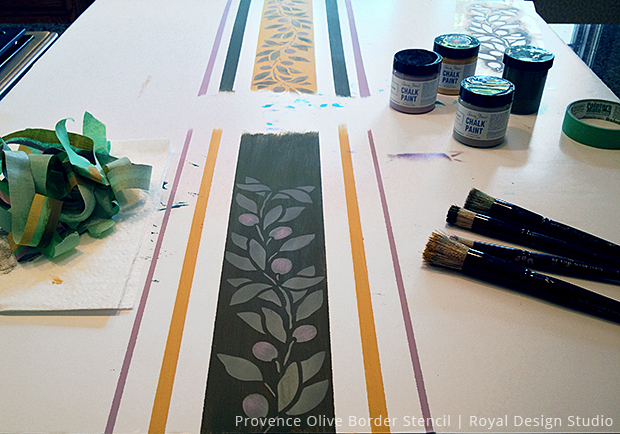 Simply set the Provence Olive Border Stencil on top of the wide stripe, and paint the stencil with a contrasting color. 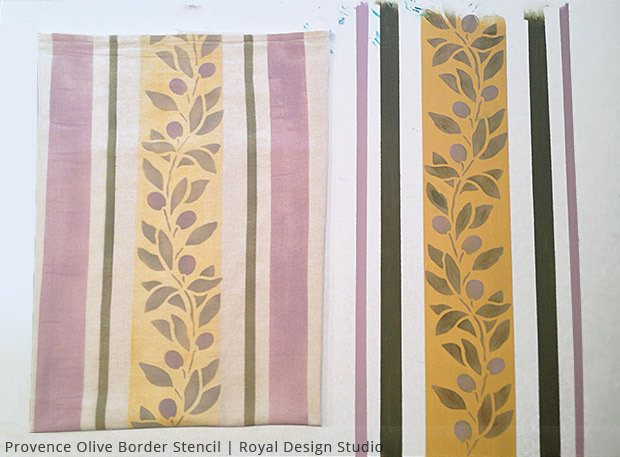 I used French Linen for the stencil, and then I brushed purple Henrietta paint very lightly on the olive shapes. Next, tape off the next stripe. While doing the “practice run” on foam core, I thought the Olive stripe was visually overpowering, so I taped a skinnier stripe for Olive. 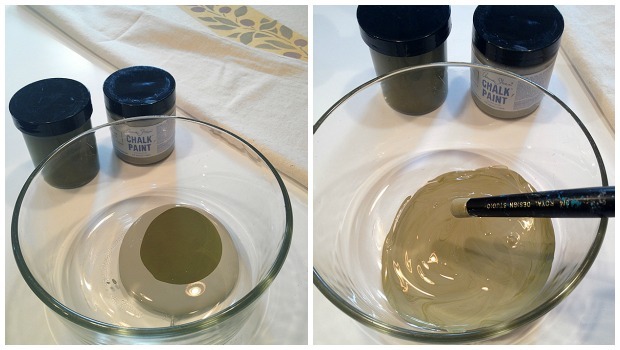 I also mixed Olive and French Linen Chalk Paints together to lighten the Olive a bit. 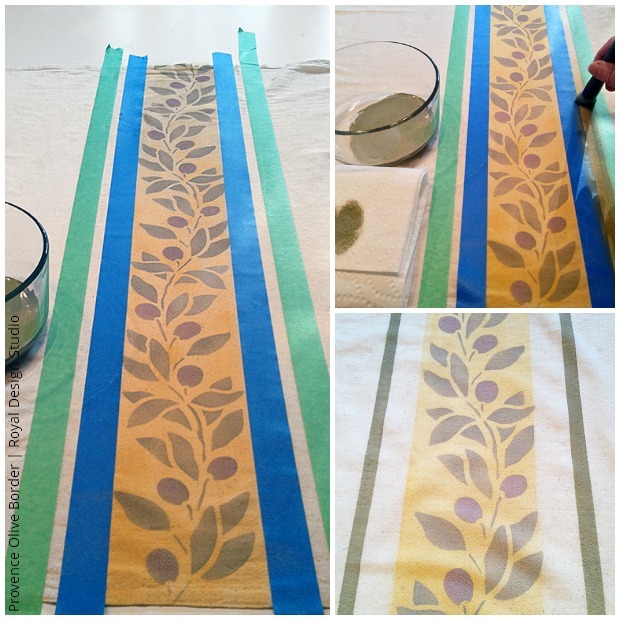 Follow this same taping and painting process for each stripe you want to paint. I taped a wider stripe for the purple Henrietta color because I wanted to emphasize this color more. Here’s a side-by-side of the practice run on foam core board, and the final result on a towel. You can see the color is lighter on the towel fabric, and I think the stripes are more pleasing on the towel. That’s only because I learned from trial and error while practicing – I definitely recommend taking that step if you do this! Speaking of error, during the very last brush stroke of Henrietta on the last stripe, there was an oops moment. I dripped a trail of purple paint on the towel where I definitely didn’t want it. But Chalk Paint can be forgiving. I immediately saturated the “oops” spot with water, rubbed lightly with a dishrag and continued to put more water on the area until the purple paint was all removed. Definitely prevention of an oops moment is the best policy! But if it does happen, treat the spot right away with lots of water. After the paint dried, I ironed the towel with a fresh plain towel on top of it for protection, to help set the paint. Here’s the final result! 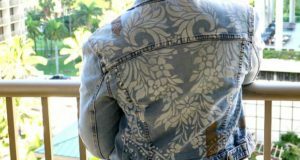 You can also see, the Chalk Paint goes into the fabric instead of just sitting on it. And it’s still soft enough to scrunch up. 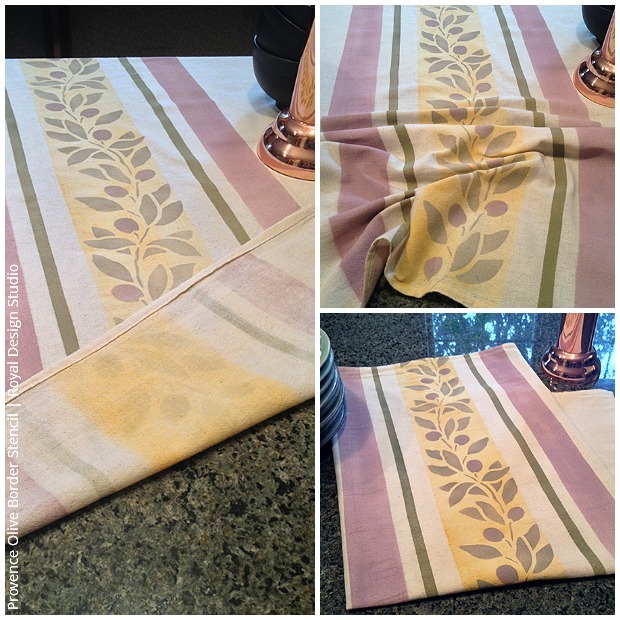 If you think a painted towel is too nice to actually use for drying dishes, that’s okay! 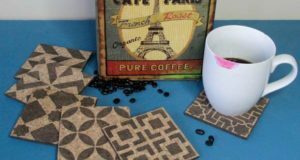 It can be draped over a towel bar or the edge of a cabinet to bring some French country color and style to your kitchen. Lovely project! LOTS of great tips here – from the color scheme inspiration to the tea towel resource. Thanks, Amisha! Great post! 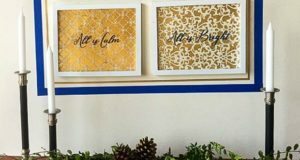 I have just tried this myself using Annie Sloan paint, your colours look great though and far more detailed than the stripe I tried! What fun, I am just wondering what your thoughts were on the sealing process? My first efforts washed off so I re did it and ironed it on longer and I think that’s sorted it. Did you do anything else to stop the colour running in the wash? Thanks ! I m always on the look out for plain tea-towels to get crafty with, but I can t find them anywhere! Where did you get yours? If you don t mind sharing?! ? ?